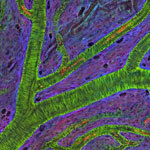 Blood vessels in a mouse retina visualized using cutting-edge imaging technology. Credit: Tom Deerinck and Mark Ellisman, NCMIR. For poets and lovers, the eyes are the windows of the soul. For scientists and doctors, blood vessels at the back of the eye are windows into many diseases. Blood vessel abnormalities can indicate a variety of serious conditions such as atherosclerosis (hardening of the arteries), heart attacks and strokes. But most vessels are buried beneath skin and other tissues, making them difficult to examine without surgery. There’s one exception—in the eye. Unlike anywhere else in the body, larger vessels on the retina at the back of the eye are directly visible through the pupil, requiring essentially only light and magnifying lenses to view. These vessels are used to diagnose glaucoma and diabetic eye disease. Because they display characteristic changes in people with high blood pressure, some researchers hope retinal vessels might one day help predict an impending stroke, congestive heart failure or other diseases stemming from dangerously high blood pressure. The medical importance of retinal vessels piqued the interest of scientists funded by the National Institutes of Health at the National Center for Microscopy and Imaging Research (NCMIR) at the University of California, San Diego, who captured this micrograph image of mouse retinal vessels. With more than 90 million Americans affected by obesity, developing medications to help combat weight gain and its associated diseases has become a priority. In a study using obese mice, a team led by Namandjé Bumpus of Johns Hopkins University recently showed that a commonly prescribed epilepsy drug, valproic acid, reduced fat accumulation in the liver and lowered elevated blood sugar levels like those associated with type 2 diabetes. 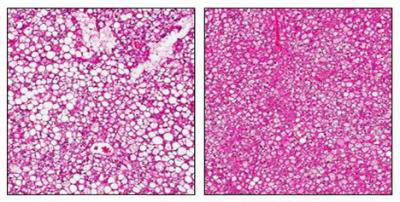 Body weight also stabilized in mice given the drug, whereas untreated mice continued to gain weight. Additional experiments in mouse and human liver cells suggested that the byproducts of valproic acid produced as the body breaks down the drug, rather than valproic acid itself, were responsible for the observed effects. These byproducts achieved the same effects in cells at one-fortieth the concentration of valproic acid, making them promising candidates for further drug development. 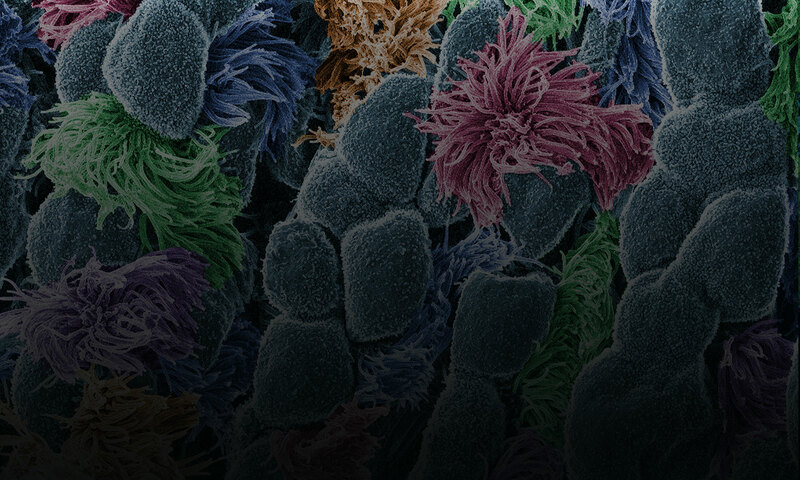 Scientists have long known that multicellular organisms use biological molecules produced by one cell and sensed by another to transmit messages that, for instance, guide proper development of organs and tissues. But it’s been a puzzle as to how molecules dumped out into the fluid-filled spaces between cells can precisely home in on their targets. 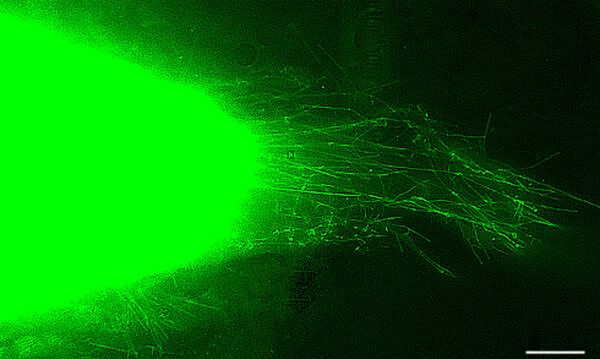 Using living tissue from fruit flies, a team led by Thomas Kornberg of the University of California, San Francisco, has shown that typical cells in animals can talk to each other via long, thin cell extensions called cytonemes (Latin for “cell threads”) that may span the length of 50 or 100 cells. 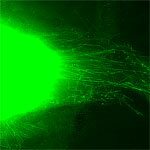 The point of contact between a cytoneme and its target cell acts as a communications bridge between the two cells. Graduated from high school at: Rockdale Magnet School for Science and Technology in Conyers, Ga.
Jasmine Johnson and Gabe Vela might still be teenagers, but they are also seasoned scientists. It all started 3 years ago, when, as high school juniors, they took the research course Independent Studies in Computational Biology at The Jackson Laboratory in Bar Harbor, Maine. They were hooked. They continued to do research until they graduated, working part-time for 2 academic years and full-time for 2 summers. They worked with statistical geneticist Gary Churchill, using computational biology to explore the relationship between sleep and obesity. 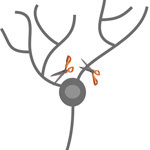 They focused on finding genes that regulate sleep and understanding how sleep affects the body. One goal of the research is to tease out a genetic explanation for why sleep deprivation increases the risk of obesity. For Johnson, the experience provided the opportunity to present her research at the 2013 White House Science Fair, where she hobnobbed with some political hot shots. Johnson and Vela visited NIH a few months ago and talked with us about their research experiences, their lives and their future goals. Jasmine Johnson & Gabriel Vela on their experience as high school researchers at The Jackson Laboratory in Bar Harbor, Maine. Article about Johnson and Vela and other young researchers, from The Jackson Laboratory’s magazine The Search. Article about the work of Gary Churchill, from NIH’s Findings magazine. For tens of thousands of years, Neanderthals lived in Europe and Asia (presumed range shown in blue) and interbred with humans, passing on some DNA to present-day people. Credit: Ryulong, Wikimedia Commons. Many of us have some Neanderthal genes. Before Neanderthals went extinct about 30,000 years ago, they interbred with humans living in Europe and Asia. Today’s descendants of those pairings inherited about 2 percent of their genomes from the big-brained hominids. A research group led by David Reich at Harvard Medical School recently completed an analysis to determine the extent and identity of Neanderthal DNA in modern-day human populations. The group found that many traits in present-day people—including skin characteristics and susceptibility to various diseases—can be traced to Neanderthal DNA. It also appears that, genetically speaking, Neanderthals and humans weren’t completely compatible. Based on the uneven distribution of Neanderthal DNA in today’s genomes, the scientists concluded that many of the male offspring of Neanderthal-human unions were infertile. In the animal world, this phenomenon is known as hybrid infertility, where the offspring of a male from one subspecies and a female from another have low or no fertility. Studying human genes passed down through Neanderthals—as well as regions of the human genome notably devoid of Neanderthal DNA—provides an increasingly complete picture of the genetic landscape that contributed to health, disease and diversity among humans today.